For controllers of NES, SNES, Wii, the adapter can connect your controllers to Switch or Windows. Fully use your old controllers. Play your Switch with your wired controllers like Gamecube, NES, SNES, SF-C Classic Edition and W-ii Classic. GBros. 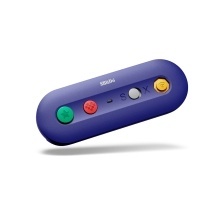 connects your wired Gamecube controller to your Switch just like a W-ii remote. It even has built-in home and screenshot buttons. Requires two AA batteries for 30 hours of gameplay time (not included).